MY PERSONAL EXPERIENCE IN THE APPLICATION FOR A SPANISH DRIVING LICENCE. I attended the CLINICA LABORATORIO in Mazarron (address below) which I understand is only open from 5pm until 7pm on Tuesday and Thursday for this purpose. Here you will need to undergo a small medical test and you will need to present the following documents. UK Driving Licence, Passport and proof of residence (Padron). Any information on the medication you are using plus any information of any hospital visits in case of illness and a prescription for spectacles. In addition you must pay a fee of 40 Euros in cash. On the left as you enter there is a small reception desk, here you present your UK Driving Licence, passport and the fee. Your documents are returned with a slip of of paper bearing the figure 40 which denotes you have paid, this you need to present to the Doctor. Please note the receptionist speaks very little English however on occasions a translator is present. Once you have completed this process you will need to go downstairs and queue to see the Doctor. He will then examine your documents,particularly your medical documents, and carry out an eye test. Should you have a particular medical condition he may ask you to obtain a note from your Doctor confirming treatment. Once this process is complete you will be asked to go to the office next door where final details will taken and your medical document issued. The next step is the application process, this can be done by yourself in Cartagena but I am not aware of the location or the process. I went to the Gestoria Zamora in Mazarron (they are located a few minutes walk from the clinic – just off the square behind the Hotel Costa), who arrange your application where a member of staff speaks English and will help you through the process. Here you need to present the following documents, Medical document, UK Driving Licence, Passport, Padron (dated within last 3 months) plus 2 photographs the size to fit the driving licence. (These can be obtained at Best Wishes, ask for driving licence photos, the cost is 5 Euros). In addition you will need to pay a fee of 75 Euros in cash, unless you aged over 70 when the fee is 55 Euros. Once the application is completed your UK driving licence will be retained having given you a copy and a cash receipt. The issue of your Spanish driving licence can be up to 3 months and will delivered to Gestoria Zamora who will then contact you for issue. Once you have your Spanish driving licence you can apply for an International licence from the same place. 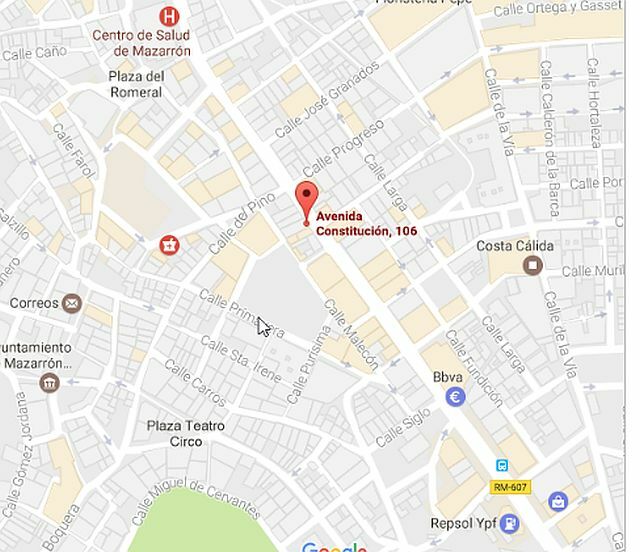 Address: Gestoria Zamora, De Mazarron, Calle San Francisco 3, Mazarron. Tel: 968591789.